This cake is a monument to my favorite comfort flavors. The earthy browned butter and toasty pecans ground the bright/tart flavors of orange caramel--the whole thing works together like a gorgeous flavor machine designed for palate-slaying bliss. Or something. Anyway here's the deal, there are a lot of fiddly little steps to this one but I am straight up and down telling you they are worth it and don't be intimidated. And don't burn your damn nuts. Watch those guys. They are expensive! 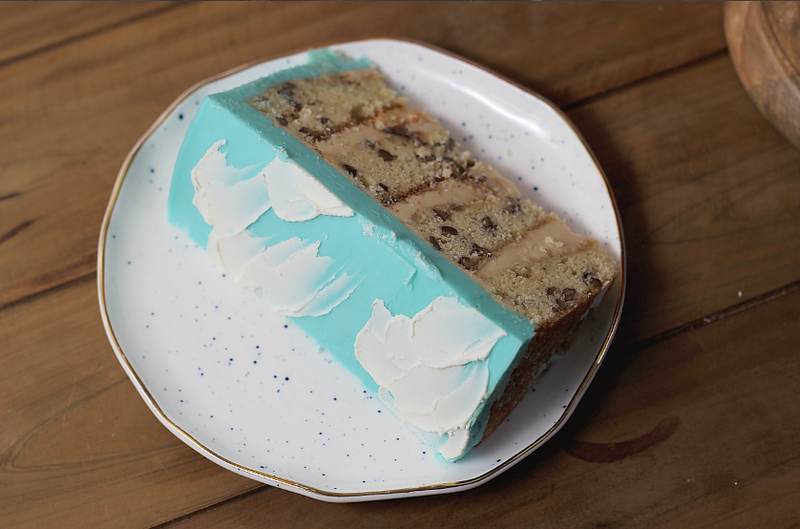 This cake is covered in vivid sky-blue white chocolate ganache (just add food coloring to your heavy cream, then make the ganache as normal) with some palette knifed-on clouds made with white chocolate ganache. 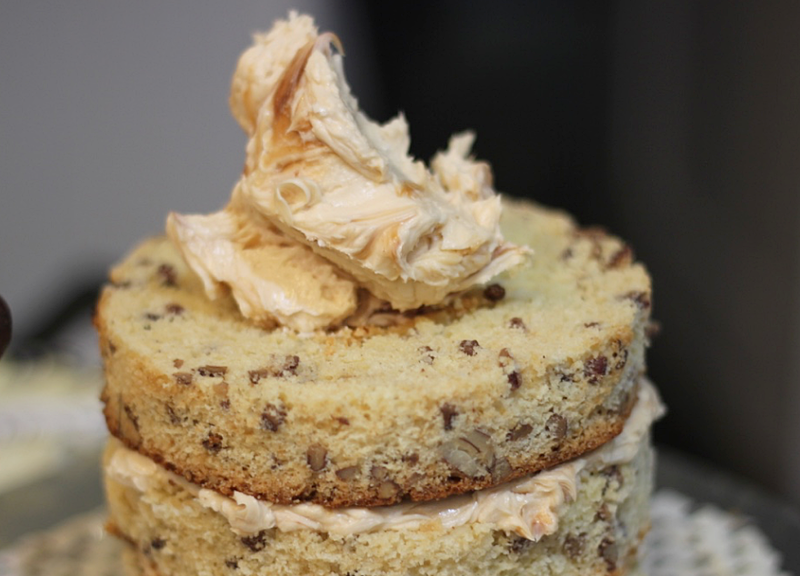 Of course you can just cover the whole thing in delicious orange caramel buttercream instead. I got the idea for this buttercream from my pal Hector when I tried one of his macarons that was filled with a similar orange caramel buttercream. My first attempts at orange caramel weren't satisfyingly orangey enough because they relied just on orange juice so I messed with the composition to up the flavor. So let's start with the caramel. 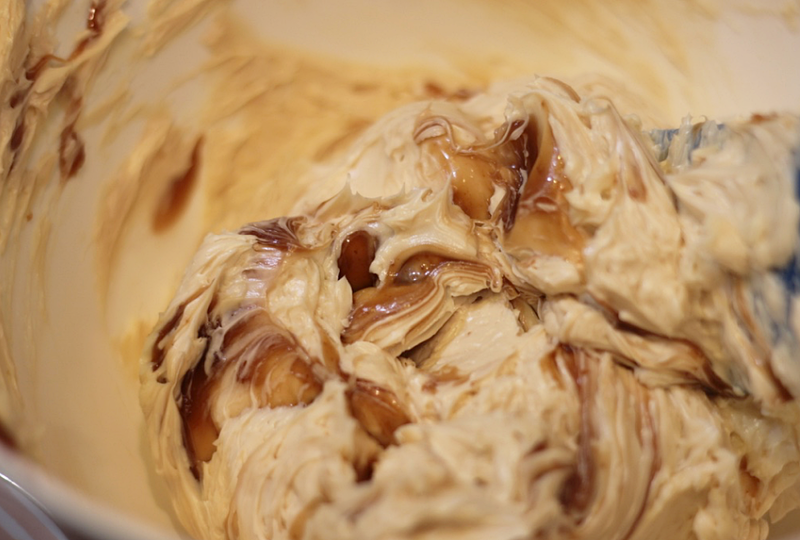 If you stop here and just make the caramel I will 100% forgive you, because this stuff is absolute gold and you don't even need a cake to pour it on--just dip apples in it, drizzle it on ice cream, or just eat it with a dang spoon as I myself did as soon as it was cool. This will make twice as much as you need for the buttercream, so the rest would be great to use as a drip/drizzle over the finished cake. Caramel is all about timing. You want to let your sugar get a bit dark so your caramel will have a slight bittersweetness to it, but you don't want to burn it. I say err on the side, though, of dark instead of light. Too light and there is no flavor at all, just sweetness. 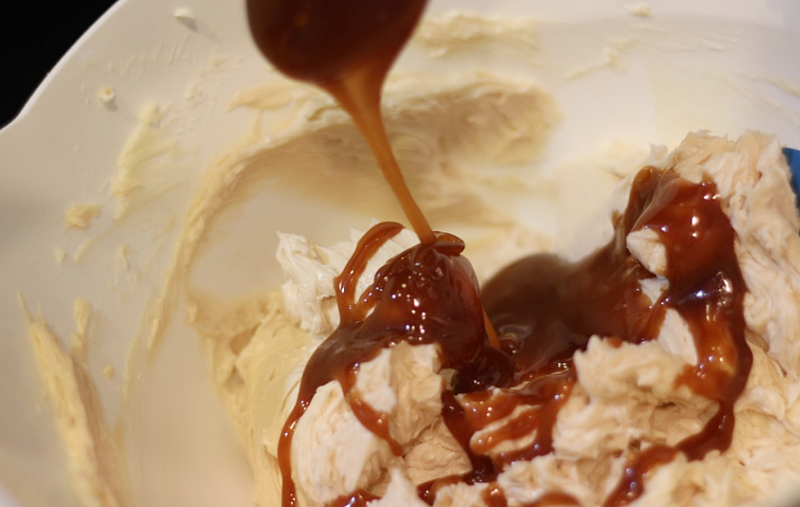 Remember, you're adding cream to this caramel so it will end up lighter than it looks in the pan. Strain orange juice into a cup measure, and fill the rest with cream to make a full cup (usually you get about 1/4 cup of juice from a large orange). Add this, along with the orange zest, to a small saucepan and allow to gently simmer on low heat while you make your caramel. In a larger saucepan, pour the water in and then add the sugar and corn syrup to the center of the pan, avoiding the sides. Stir gently so the mixture is even, and allow to boil over medium high heat. Make sure you have a large metal fine mesh sifter/strainer ready. As the sugar caramelizes, swirl or stir it so the browning is even, and pull it from the heat as soon as the mixture is a deep mahogany color. Strain the orange cream mixture into the caramel--be careful, it will steam and bubble up. Mix thorough and return to low heat. Add butter and mix until melted. Stir in salt and transfer to a heatproof bowl and allow to cool at room temperature. To make the orange caramel buttercream, simply whip up 2 cups (4 sticks) of softened unsalted butter with about a cup (to taste) of powdered sugar and add about half of this caramel. I whipped some in and then folded the rest in so there would be lovely delicious streaks of caramel running through the buttercream. Next, this cake! I made, oh I don't know, at least 15 different iterations of this cake until I landed on a texture/flavor I liked. Mostly I was messing with eggs and egg yolks and flour proportions. You see, whole eggs add structure but the whites tend to dry cakes out, while yolks add velvet moistness but too many can lead to a dense, heavy cake. On top of that, you have your pecans, which are going to weigh your rise down, so all of this had to be maddeningly calibrated just so with a jillion test cakes. You're welcome. If you've never browned butter before, first of all who are you, and second of all don't worry it's super easy. You just cook the butter until it is browned--but watch it carefully....like caramel, nothing happens for a long time and then suddenly everything browns very quickly. I've noticed the bubbling sound of the butter dies down as it starts to brown (the water is all evaporated at that point so less bubbling sounds?) so that's a good cue you are getting close. Sometimes the foam on top makes it hard to see what's going on with the bottom of the pan, so feel free to stir as it starts to brown so you don't let it burn. This is such an incredibly flavorful cake. Browned butter just adds and extra nutty oomph to the toasty pecans and the texture is dense and rich. It's really great just on its own, without frosting, if you're into that kind of thing. 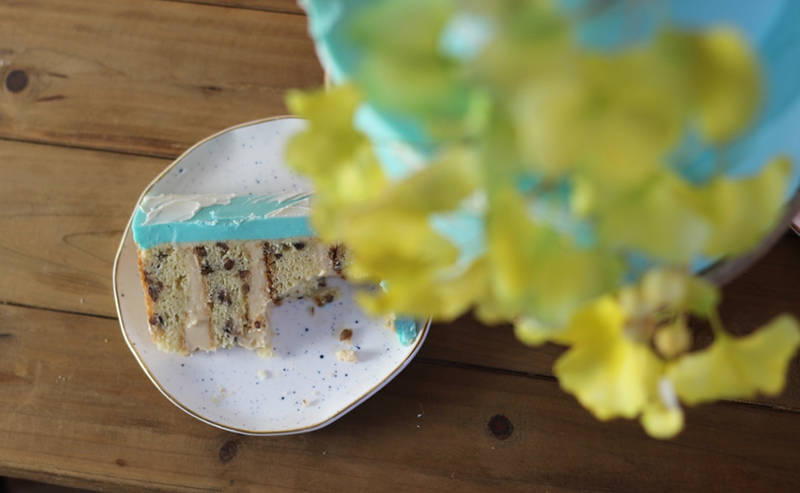 Now, I like just a drop of natural butter flavor added to this cake for a true butter pecan flavor, but it is optional (this one is great). If you layer your extracts with subtlety the flavor can be wonderful (not artificial tasting). This makes enough for two 8" pans but you can double this easily for a lovely tall cake, which I recommend. Prepare pans by greasing and flouring sides and lining bottoms with parchment. Toast pecans and set aside to cool. Sift flours and baking powder into a small bowl. I know sifting is annoying but you really have to do it for this recipe--do not just stir with a whisk. Add sugar and salt to a large bowl, set aside. In a large saucepan, add the butter and cook over medium heat until butter browns. Remove from heat and pour over sugar and salt, scraping the saucepan to get all the delicious browned butter solids. Use a hand mixer to whip for about one minute, then add cream and mix until fully incorporated. Place this mixture in the freezer for about 10 minutes or until room temperature/cool (do not allow to freeze). Remove from freezer and continue to whip the butter and sugar mixture until thick, light and fluffy, for about 4 minutes. Add yolks, one at a time, then the eggs and the extracts, beating until the mixture is light and fluffy. This should take about 10 minutes total. Add flour in two batches, mixing on the lowest speed until just incorporated. Fold in pecans. Divide evenly among pans and bake for about 18--22 minutes or until center springs back when touched. Trim cakes, then fill and frost.